The Boston Celtics might just tread water this offseason, adding non-crippling contracts to stay afloat in 2014-2015 in order to set themselves up for a splashy 2015 offseason. Or, as many interviews indicate, the fireworks could very well happen this summer. 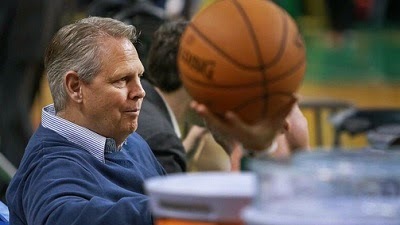 We all know Danny Ainge is a wizard when it comes to making trade magic happen. He has done it before. I brewed up five trades of my own to make the Celtics rise to the top again. Make it happen, Danny. I'm sure you can engineer something. It wouldn't be the first time. Moving Gerald Wallace might prove tricky, since he has 2 years left on his deal at $10 million per, but a draft pick (or two, if necessary) and the expiring contract of Joel Anthony might do the trick. The Celtics have had their eyes on swingman Gordon Hayward for a while now, and with the Jazz going nowhere fast, they could actually afford to take on Wallace if it means picking up assets to help the rebuild. Half the league is making offers to the Timberwolves for Kevin Love, who desperately wants out of Minnesota. Passing on a young bruiser like Jared Sullinger, the $11 million contract of Richard Jefferson (which expires July 1), and three draft picks would be a hard thing for GM Milt Newton to do, especially since he could very well lose Love for nothing next year. The Orlando Magic are rebuilding, leaving 28-year old shooting guard Arron Afflalo looking for greener pastures. The expiring contract of Brandon Bass could immediately be flipped for other pieces, and scoring guard Jerryd Bayless would duplicate some of Afflalo's skills at a much cheaper price. Win-win. Jeff Green is not the featured scorer Boston fans wanted him to be. The Washington Wizards happen to like Green, who played ball at Georgetown. It's a match made in heaven. Trevor Ariza would be the closest thing to James Posey on the Celtics roster since, well, James Posey in 2008. He can defend, shoot from behind the arc, and play multiple positions. A starting five of triple-double threat Rajon Rondo, efficient shooting guard Arron Afflalo, former Butler Bulldog Gordon Hayward, 20-10 power forward Kevin Love and dominant defensive center Omer Asik would give opposing teams a lot of problems. And with a bench of Phil Pressey, Avery Bradley, Trevor Ariza, Kelly Olynyk and Vitor Faverani, coach Brad Stevens has a lot of auxiliary weapons at his display. These moves would instantly vault the Celtics into contention again. I'm not sure the other teams would consider those trade proposals. Boston could definitely be more aggressive than 'treading the water' this offseason though.